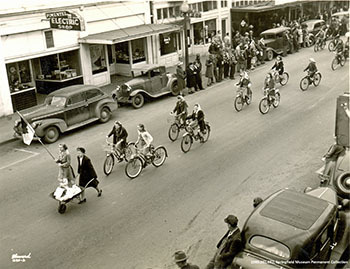 The Springfield Museum’s latest exhibit, “Freedom on Two Wheels: Springfield’s Bicycling Past”, is opening Friday, May 10, 2019 at the Springfield Museum. The exhibit will run from May 10 to June 29, 2019. This exhibit is an exploration of the role of bicycles in Springfield’s past, and the different liberties that bicycles offered local community members. From affordable mobility to freedoms from societal restrictions, the bicycle had a large impact on life in Springfield from the 1890s onward. The opening reception will take place on Friday, May 10. From 2:30-4:30 p.m., the Museum will be hosting a “Get to Know Your Bike” event in the Museum parking lot. This event is geared towards children and will feature helmet fittings, bike decorating and safety checks, a raffle, and more. The opening will continue for all ages from 5-8 p.m. during the Downtown Springfield Second Friday Art Walk, with refreshments available in the Museum. This event is part of the regional May is Bike Month. National Bike Month has been celebrated around the country since 1956. In Springfield we have participated in May is Bike Month events since 2014. Bike Month is a great opportunity to showcase the many benefits of bicycling and to encourage more folks to give biking a try. For more May is Bike Month information, including a full listing of events being held, visit WeBikeLane.org. Regular museum hours are 11 a.m.-4 p.m., Thursday-Saturday. Admission is free! For more information, visit us on Facebook or call 541.726.2300.